While most pasta dishes have their sauces and toppings brazenly displayed Italy's numerous varieties of filled pasta are a more modest bunch, keeping the majority of their flavour tucked away inside. From familiar faces such as ravioli and tortellini to agnolotti and other more unusual varieties, this collection of filled pasta recipes will provide some fantastic menu inspiration – as well as offer assistance on preparing fresh pasta. Gaetano Trovato's Ravioli with ricotta, spinach, tomato and basil is a fantastic easy pasta recipe which is packed with fresh flavours, or try his Lobster ravioli recipe – served with foie gras and a vivid saffron sauce – for an impressive dinner party starter. 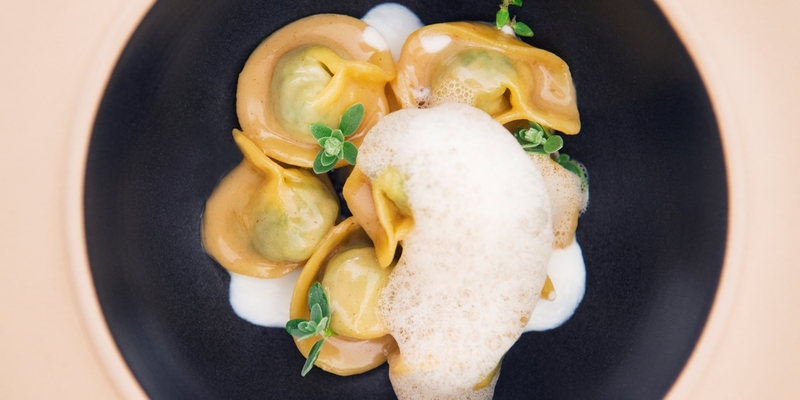 Aurora Mazzucchelli's exquisite Parmesan tortelli has the fragrant additions of lavender, nutmeg and almond, and similarly Lorenzo Cogo's impressive pasta starter recipe combines ravioli with flowers, almond milk and an unusual hit of tequila.